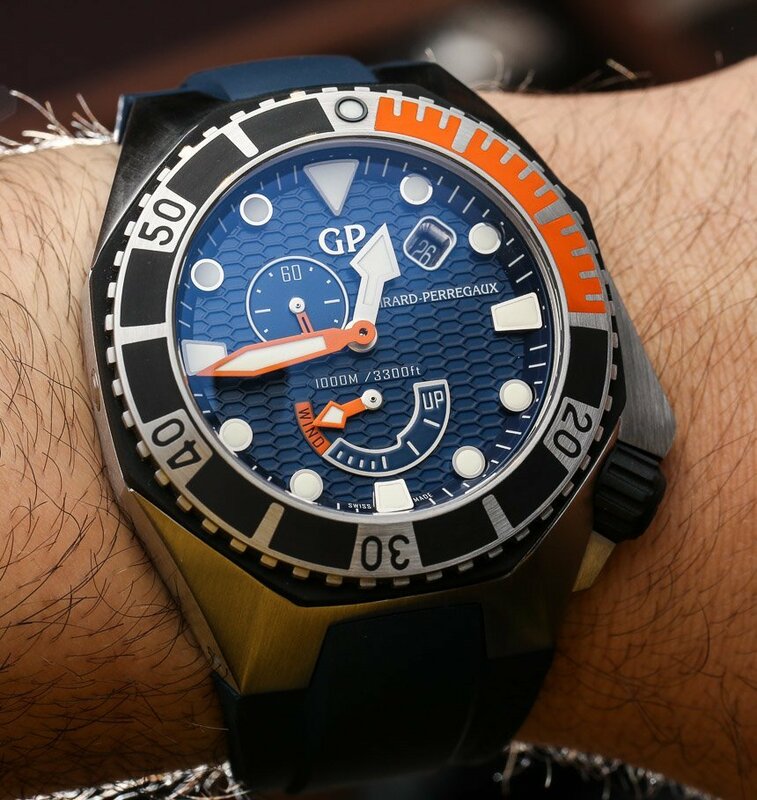 In late 2012, Girard-Perregaux introduced a new collection of Sea Hawk watches (along with the new Chrono Hawk) that reinvented their classic high-performance dive watch. 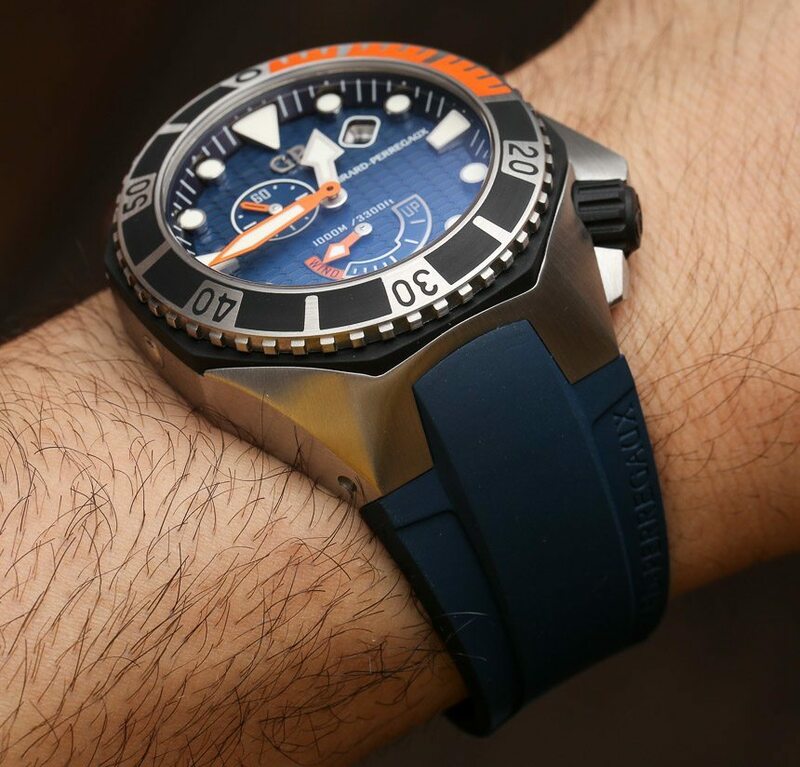 aBlogtoWatch went hands-on with the new Girard-Perregaux Sea Hawk watch here. Since the debut of the collection, Girard-Perregaux has added a lot of new models, but has also refined the collection considerably. The most important area of improvement is how the watch wears on the wrist. The initial collection of Girard-Perregaux Sea Hawk watches were difficult to wear if you had smaller or even medium-sized wrists. This was because in addition to the large lug structures, the strap jutted outwards more than it did downwards. By clicking on the article above you can see how the original “new” Girard-Perregaux Sea Hawk watches looked on the wrist. I am really happy to say that Girard-Perregaux has redesigned both the strap (and now bracelet) such that the new “Hawk” watches are infinitely better to wear. Talking about wearing comfort seems like a good way to discuss what is my favorite new Girard-Perregaux Sea Hawk watch for 2014. 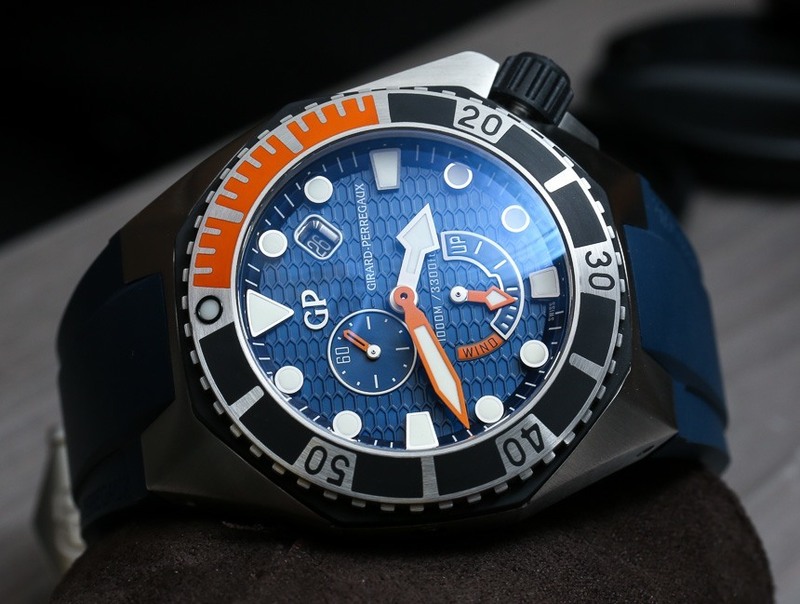 This is the Girard-Perregaux Sea Hawk Blue, and it is marked by a dominantly blue dial with orange accents and orange and black bezel. 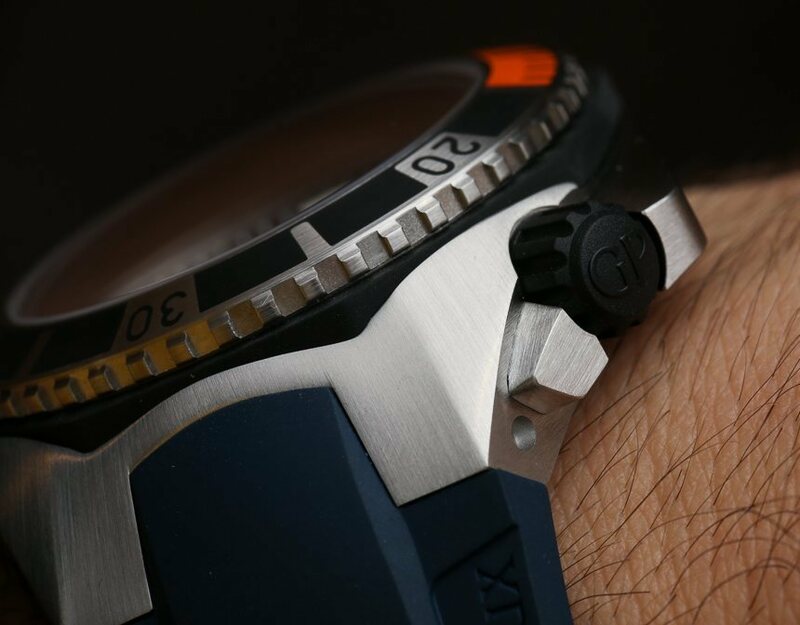 The rotating diver’s bezel has inset vulcanized rubber and the 0-15 minute markers used orange rubber versus black. 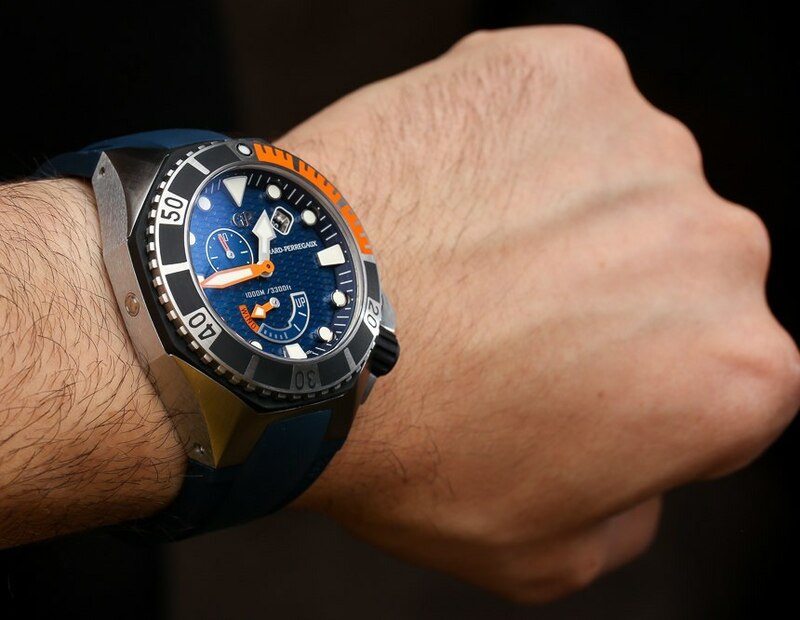 For a long time, many of the Girard-Perregaux Sea Hawk watches have used an orange minute hand, as it is common on some professional dive watches to do so. In most of those instances, I appreciated the extra legibility, but felt that the bright orange hand didn’t mix well with a sense of luxury. 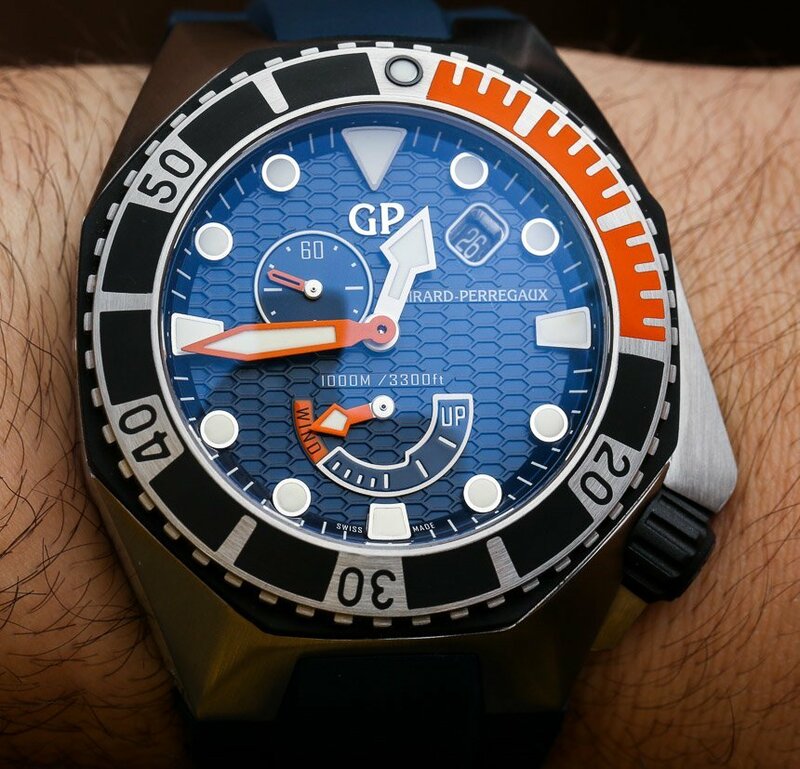 However, for the Girard-Perregaux Sea Hawk Blue, Girard-Perregaux has cleverly integrated the color orange into other parts of the design so that the orange minute hands looks much better. That includes use of orange for the other hands as well as for part of the power reserve indicator on the dial. I have to say that the slightly metallic blue for the honeycomb dial is really lovely and plays nicely with the dial. I’ve long enjoyed the depth of the Girard-Perregaux Sea Hawk dials as well as the detailing, and for me this is the best one yet. Why? Well, part of it has to do with the watch looking good, but also feeling like a nautical instrument. The dial is high-end, but really legible, and I find that there are only a dozen or so luxury dive watches that can claim this. Few have as much modern detailing as the Girard-Perregaux Sea Hawk, and are classic or traditional by comparison. The Girard-Perregaux Sea Hawk case is in steel and sized at 44mm wide, though it does wear large given the broad lugs and 17.1mm of case thickness. The case is water resistant to 1000 meters, with a helium escape valve, and inside the watch is the Girard-Perregaux in-house made caliber GP03300-0074 automatic movement. It has a module on it that offers additional features such as the power reserve indicator, date, and subsidiary seconds dial. While asymmetrical, the dial is nevertheless well-balanced. I also happen to adore dive watches with power reserve indicators on them. It has a power reserve of 46 hours by the way and operates at 4 Hz. Large, properly-sized hour and minutes hands along a track of bold lume-filled hour markers complete this wonderfully instrumental, yet attractive dial design. Girard-Perregaux offers the Sea Hawk Blue on both a blue rubber strap or a steel metal bracelet. I’ve tried them both on and I have to say that Girard-Perregaux has more than made up for any wearability issues the Hawk collection had upon its initial debut. These wear wonderfully on my mid to small-sized wrists.